UPDATE: Marvel and Fox have refuted this rumor...For now. Here is the original story: Is it true? 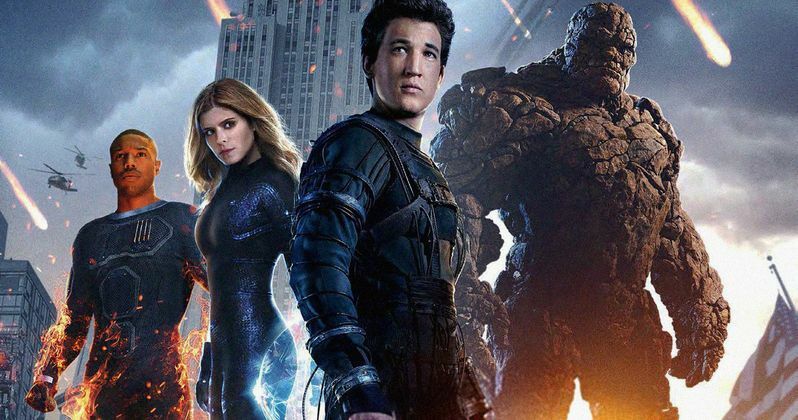 Has Marvel struck a deal with 20th Century Fox that sees them getting the rights back to the Fantastic Four franchise? And is Marvel and Disney planning a new movie for 2020? That's the rumor Den of Geeks is running with this morning. And it's news that has been heavily speculated since the Fantastic Four reboot opened this past August, becoming one of the biggest bombs of the year. Though, how /fantastic-four-2-20th-century-fox-commitment/Marvel and Fox reached the deal, if true, is a little unexpected. Yesterday, we reported that there are two X-Men live-action TV shows happening, with Marvel and Fox collaborating on each. Hellfire is coming from the Fox Network and centers on the notorious billionaire's gang and longtime rival of the X-Men, the Hellfire Club. Legion is coming from FX and centers on Professor Xavier's long tormented son. Both shows are set within the X-Men movie universe. An X-Men live-action TV series has been in development for a while, as Fox awaited Marvel's approval to move forward. Now, it seems that only happened once 20th Century Fox allowed the Fantastic Four franchise rights to revert back to Marvel and Disney. According to Den of Geeks, this new deal also gives Marvel the rights to use such villainous characters as Galactus, Doctor Doom and the Silver Surfer. Which, if true, could greatly change what is being planned for Avengers: Infinity War Part I and Avengers: Infinity War - Part II. Having Fantastic Four now housed at Marvel, a whole world of possibilities has opened up. This makes sense, especially since Kevin Feige recently confirmed they have always had a contingency plan in place when and if this ever happened. Last week, Disney announced three untitled movies for 2020, all of which will kick start Marvel Phase 4 after Avengers: Infinity War - Part II decimates the MCU as we know it. If this latest rumor is at all true, that means a Fantastic Four reboot is set to be one of these three movies. 20th Century Fox, on the other hand, is reportedly abandoning Marvel's first family in order to fully devote its own version of the Marvel Cinematic Universe to the X-Men. They already have three movies planned for 2016, which includes Deadpool in February, X-Men: Apocalypse in May, and Gambit in October. X-Men: Apocalypse is bringing Bryan Singer's X-Men saga, which spans the first six films, to a close while setting up a rebooted X-Men series for the future. And at this point, there is the strong possibility that Gambit will get pushed into 2017, as the studio searches for a new director. Rupert Wyatt dropped out earlier this month. In 2017, Fox has the sequel Wolverine 3, which will be Hugh Jackman's last time playing the indestructible mutant Logan. Also in development are movies for The New Mutants and X-Force. No release dates have been given for either film. The Fantastic Four 2 was already given a June, 2017 release date. But if Marvel now has the rights, that means Fox will probably give this release date to the rumored Deadpool 2. None of these new claims have been confirmed by anyone at Marvel, Disney or 20th Century Fox. But they do make a lot of sense. Fantastic Four opened to the tune of $25.6 million on August 7th. Budgeted at $120 million, the film has only earned $56 million at the domestic box office, with a worldwide tally of $166.6 million. Is this news true? Is Reed Richards and family back at Marvel? Well, we'll probably get a confirmation sooner than later. At least we're getting a couple of X-Men TV Shows!